An approaching storm over Highway 212 in Codington County. 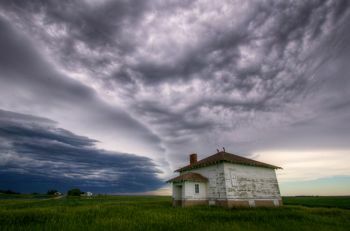 An approaching storm over an old country schoolhouse in southern Day County. Evening storm clouds building in Walworth County. 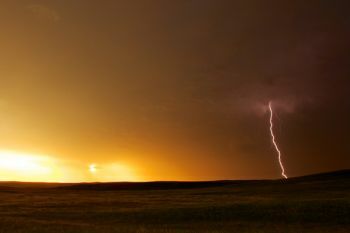 A lightning bolt near sunset on the open prairie of Corson County. Lightning and taillights south of Hartford. 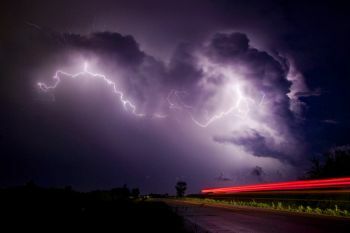 A night storm in McCook County. 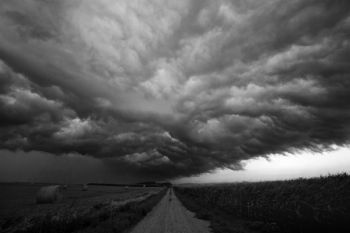 Storm clouds can be very dramatic in black and white photography as demonstrated by this shot taken west of Garretson. Mammatus clouds on the edge of a storm west of Watertown. This rainbow came after a particularly windy rainstorm in Harding County. 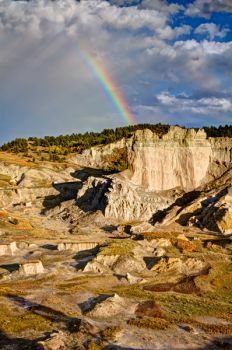 The same rainbow from the Castles outlook in the Slim Buttes. Between rain storms at Belleview Lutheran in Miner County. 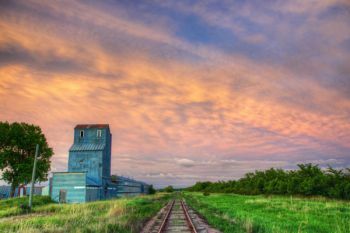 After the storm on Betts Road, west of Mitchell. 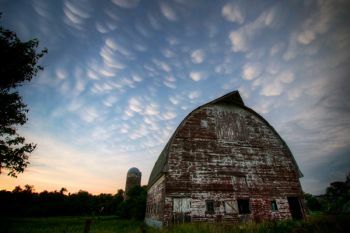 Mammatus clouds on the edge of evening in rural Turner County. 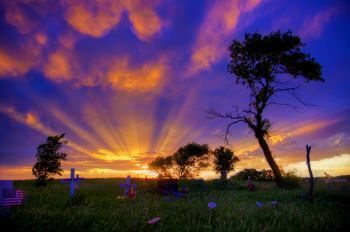 Beautiful after storm evening light over Buffalo Lake Church’s cemetery in rural Marshall County. 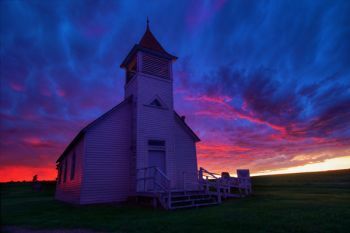 Buffalo Lake Church after the storm. 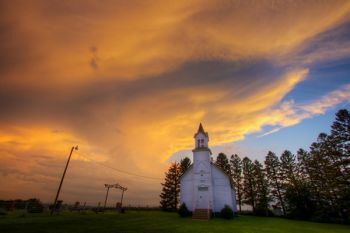 The setting sun lighting a building storm cloud near Pleasant Hill Chapel in rural Union County. 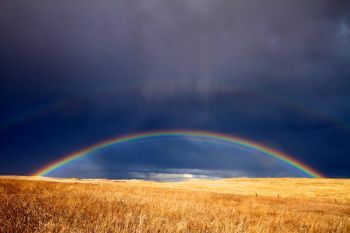 A double rainbow west of Vivian after an early autumn wind and rainstorm. 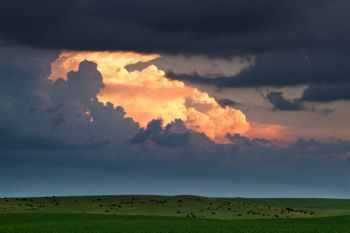 A summer sunset backlight thundercloud north of Sioux Falls. 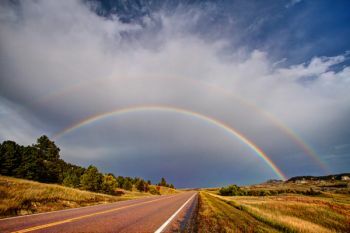 I learned early that rain is a blessing in South Dakota. I remember well the dry years of the early 1980s. I was a just a kid on our farm on the border of Dewey and Ziebach counties. The heat was relentless, and the wind blew great congregations of grasshoppers from field to pasture. I remember the hungry ’hoppers stripping even the kosher weeds to bare stems one particularly bad summer. Water gun fights and orange sherbet push-ups helped cool us. A few nights were so hot I remember filling my small squirt gun with water and shooting at the ceiling so the water would fall down as if it were raining on me while I lay in bed. I grew up thinking that hot, dry summers were the norm. Those experiences are probably rainstorms are blessings and things of beauty to me today. Over the years South Dakota has proven that hot and dry summers really are not that normal. Despite reading the Old Farmer’s Almanac, you never know what the warm months will bring. This year has been wetter than most. Some areas got too much of a good thing, resulting in flash floods and washed out roads. Tornadoes, wind and hail have also caused damage. 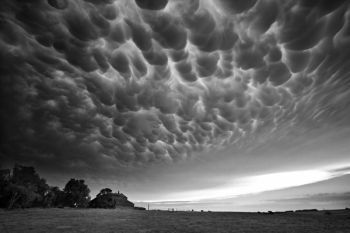 Yet photographing the colossal clouds, lightning and general impressiveness of a South Dakota storm never seems to go out of style. 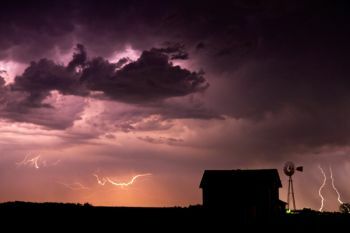 Whether you are a professional storm chaser or an average Joe with a smart phone, getting a decent shot of the drama in the sky is a thrilling accomplishment. I think part of it is the inherent danger. Lightning strikes, high wind and hail are life threatening at worst and white-knuckle nerve wracking at least. Modern day radar technology makes watching storm development easy, which helps predict where a storm will be. 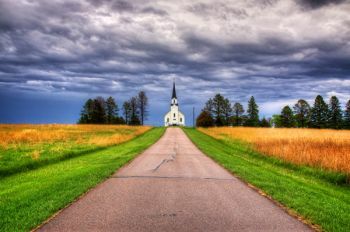 Knowing the terrain — where to find a good structure like a barn or a church to include in the photo for perspective and framing — is important. As with most really good photography, patience is also key. I’ve learned the best shots often come after the storm. 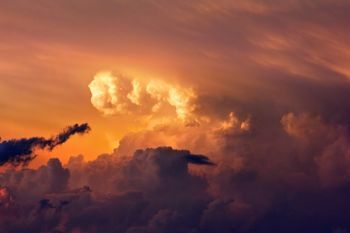 Some of the most beautiful light ever seen is the early evening summer sun shooting through the last clouds of a passing storm. People often ask me how to shoot lighting, but I don’t have great answers. My first attempts involved resting a Minolta film camera on a barbwire fence behind our farm as an August dry lightning storm passed overhead. Not smart. What I know now is that you need a tripod. You need to know your camera well enough to keep the exposure open as long as possible (without overexposing). Also, use a remote trigger and be persistent. I once had two cameras shooting time lapses of an approaching afternoon storm with significant lightning over Bear Butte. Out of over 1,400 frames only two caught lightning strikes. 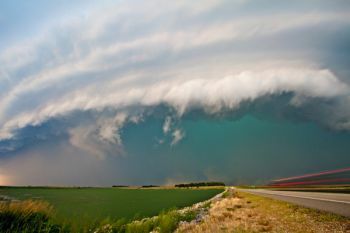 A storm’s beauty is more than lightning and impressive cloud structures, though. The rolling thunder, the smell of rain on the wind and the first cool gust of air on a hot summer’s day can’t be captured with a photograph, but because of pursuing the photograph these things are captured in my experience and held in my memory. A good rainstorm will always be a thing of beauty to this South Dakotan.